Every week, the Etsy NJ Team sponsors a Blog Hop. It's a wonderful way of showcasing all the wonderful talent comes from the Garden State of NJ! This week, I chose to talk about my pal, Doreen, of Sea Horse Designs. I met Doreen at the Handmade Faire ~ organized by two great Etsy NJ Women Abbie & Pola ~ the show was a wonderful mixture of talent and we all met those members with whom we chat via email, daily. I know that this week, Easter & Passover is upon us; however, the crafter in me is looking ahead towards Mother's Day. Crazy, you say?! I think it's always a great time to think of those special women in our lives that have inspired us and loved us ~ whether they are our Moms, Aunts, Sisters, Grandmothers, or even Friends/Mentors. Like this wonderful Fantasy Purple Lampwork and Crystal Shawl Scarf Pin (above). 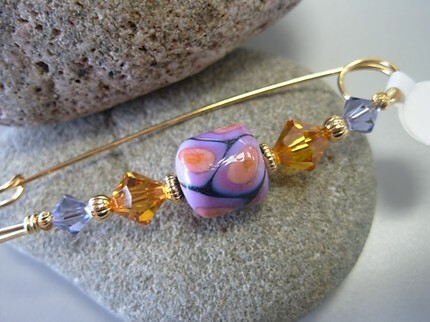 Elegant Shawl Pin with a gorgeous focal handmade lampwork bead accented with Tanzanite and Topaz Swarovski Crystals & gold beads. 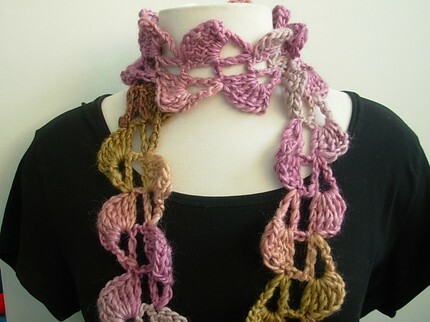 One of my favorite designs, Petals English Garden Lariat Lightweight Scarf (pictured above). Just a lovely lightweight accent to any outfit... click on the link and see all the variety of ways to style your new Lariat. 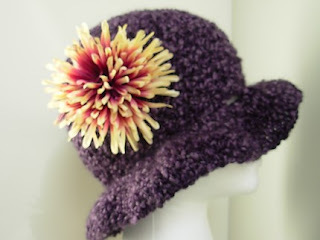 And what a wonderful Spring Hat~ Purple Crocheted Brimmed Cloched Hat with Flower (above). This hat is so versatile, soft and warm. I used a gorgeous deep purple colored acrylic yarn. The yarn is very soft to the touch and not rough at all. You can wear the brim up, down, or up on one side. Very chic! Also, follow along with our Team Hop and see all the other great artists! Great pics - Love the hat!! I love seahorse designs! Great shop and a great feature. Darn, I meant to get a stitch counter. I'll make a list for when I see Doreen in June at the Field Dog Expo and Family Fun Day in Medford. Just love her and her shoppe!! :D Thanks all for stopping by!